•Selected by Golden State in the first round (30th overall) of the 2015 NBA Draft. •Appeared in 58 games (four starts) over two seasons with Golden State, averaging 2.5 points and 2.3 rebounds in 8.1 minutes while shooting 52.6 percent from the field. •Won an NBA Championship with Golden State in 2017. •Appeared in 53 games (four starts), averaging career-highs with 2.5 points and 2.3 rebounds in 8.4 minutes while shooting 52.3 percent from the field. •In four starts, averaged 4.0 points, 4.0 rebounds and 2.3 assists in 17.7 minutes. •Scored in double figures twice. •In his fourth career start on 3/11 at San Antonio, tallied two points and four rebounds in 17 minutes. •Scored 10 points on 2/8 vs. Chicago, his second career game in double figures. •In his third career start on 12/22 at Brooklyn, scored four points, grabbed six rebounds and dished out a career-high five assists in a career-high-tying 18 minutes. •In his second career start on 12/11 at Minnesota, tallied four points and three rebounds in a career-high-tying 18 minutes. •In first career start on 11/26 vs. Minnesota, recorded six points, three rebounds, two assists and one steal in a career-high 18 minutes. •Tallied a career-high 11 points, his first career game in double figures, on a perfect 5-of-5 from the field (including his first three-pointer of the season) on 11/4 at the L.A. Lakers. •DNP-CD 20 times... Inactive three times, including once due to a sprained right ankle (12/10)... Missed six games due to a left hip strain (3/29-4/2, 4/8-4/12). •Appeared in four games (one start) over the course of three assignments with the Santa Cruz Warriors of the NBA G League, averaging 12.8 points, 11.3 rebounds and 1.00 block in 19.8 minutes. •Tallied a double-double with 12 points and 10 rebounds in 22 minutes on 3/18 vs. Texas. •Grabbed a Santa Cruz season-high 20 rebounds to go with a season-high 18 points in 24 minutes on 1/13 vs. Salt Lake City. •Missed 12 postseason games due to a left hip strain... Inactive five times. •Appeared in five games with Golden State, averaging 1.8 points and 2.0 rebounds in 4.2 minutes. •Grabbed a career-high eight rebounds in a career-best nine minutes on 2/19 at Portland. •Hit the first three-pointer of his career on his first career three-point attempt on 2/10 at Phoenix, finishing with a career-high three points. •Made his NBA debut on 1/27 vs. Dallas, scoring two points and grabbing two rebounds in six minutes of play. •Appeared in 12 games with the Warriors’ NBA D-League affiliate in Santa Cruz, averaging 9.8 points and 7.4 rebounds in 19.3 minutes. •Made his professional debut with the Santa Cruz Warriors on 1/12 at Idaho, scoring 11 points and grabbing 12 rebounds in 17 minutes off the bench. •Underwent successful right hip arthroscopy on 8/20 to repair a torn labrum. •Inactive 64 times, including 38 times following offseason surgery on his right hip and 11 times while on D-League assignment in Santa Cruz... DNP-CD eight times... Missed 16 games with a left hip injury. •Underwent successful left hip arthroscopy on 4/22 to repair a torn labrum. •Missed three games with a left hip injury and 21 games following left hip surgery. •Appeared in 36 games (all starts) as a freshman at UCLA, averaging 11.6 points, a team-high 9.2 rebounds (second in the Pac-12), 1.4 assists and 1.28 steals in 30.9 minutes, shooting 47.0 percent from the field and a team-high 41.5 percent from three-point range. •Earned Second Team All-Pac-12 and Pac-12 All-Freshman Team accolades. •Named to the NABC All-District 20 Second Team and was a CBS Sports Second Team Freshman All-America selection. •Led all freshmen in the nation with 15 double-doubles. •Grabbed 331 total rebounds, the most in a single season at UCLA since Kevin Love collected 415 boards as a freshman in 2007-08. •Scored in double figures 25 times and 20-plus twice. •Helped UCLA advance to the Sweet Sixteen of the NCAA Tournament with 10 points and 11 rebounds on 3/21 against UAB. •Earned Pac-12 Player of the Week honors on 1/12 following home wins over Stanford on 1/8 and California on 1/11, averaging 21.0 points and 13.0 rebounds over those two contests. •Set career-highs with 27 points and 19 rebounds on 1/8 vs. Stanford, becoming the first Bruin to record at least 27 points and 19 rebounds in a single game since Ed O’Bannon recorded 28 points and 19 boards on 2/26/94. •Became the first freshman in UCLA history to notch at least four double-doubles through his first five games with the Bruins. •Four-year varsity letterwinner at Hamilton High School in Milwaukee. •Earned McDonald’s All-America honors and Parade All-America acclaim as a senior in 2013-14. •Named the 2014 Gatorade Player of the Year and Associated Press Player of the Year in the state of Wisconsin as a senior. •Named Mr. Basketball by the Wisconsin Basketball Coaches Association as a senior. •Named 2014 Milwaukee City Player of the Year by the Milwaukee Journal Sentinel as a senior. •As a senior in 2013-14, averaged 27.9 points, 12.7 rebounds, 8.0 blocks and 7.0 assists. 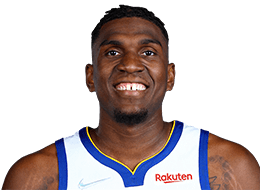 PERSONAL: Full name is Kevon Grant Looney (pronounced keh-VON LOO-nee)... Son of Doug and Victoria Looney... Has an older brother, Kevin, and an older sister, Summer... Competed for the Milwaukee Running Rebels AAU team and worked as a youth basketball instructor and peer tutor on behalf of the Running Rebels Community Organization and the Milwaukee Violence Free Zone Initiative... Earned Second Team All-Pac-12 and Pac-12 All-Freshman Team accolades in his lone season at UCLA in 2014-15... Led all freshmen in the nation with 15 double-doubles... Grabbed 331 total rebounds, the most in a single season at UCLA since Kevin Love collected 415 boards as a freshman in 2007-08... Four-year varsity letterwinner at Hamilton High School in Milwaukee... Named the 2014 Gatorade Player of the Year and Associated Press Player of the Year in the state of Wisconsin as a senior... Named Mr. Basketball by the Wisconsin Basketball Coaches Association as a senior... Is on Twitter @Loon_Rebel5.